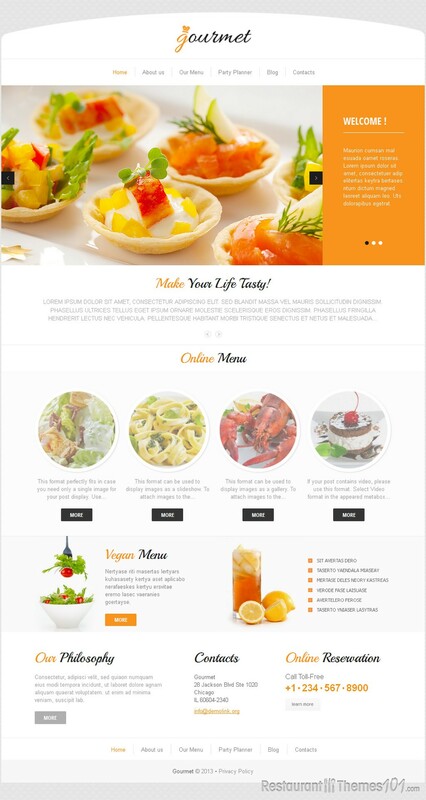 Gourmet is a WordPress restaurant theme created by Delta, featured on Template Monster. 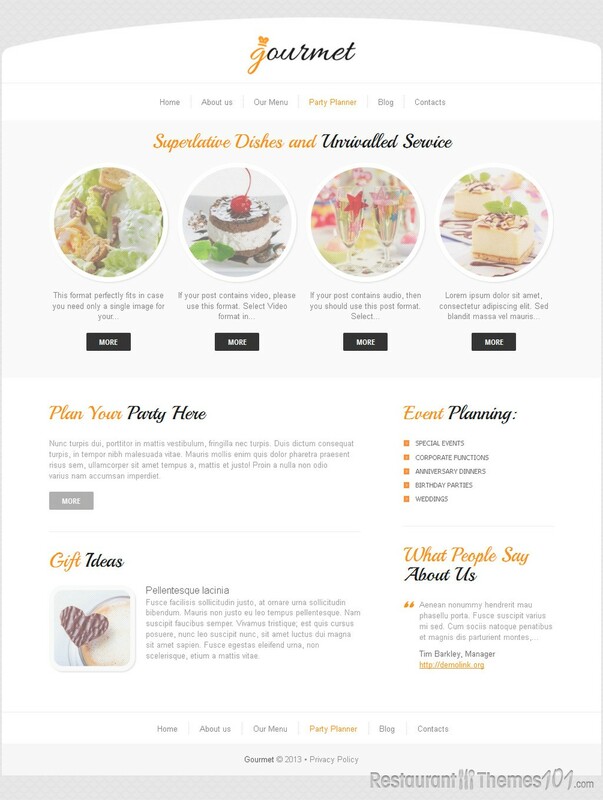 The theme looks very attractive and it can fit any food related business. It can just as well be used as a WordPress cafe theme. 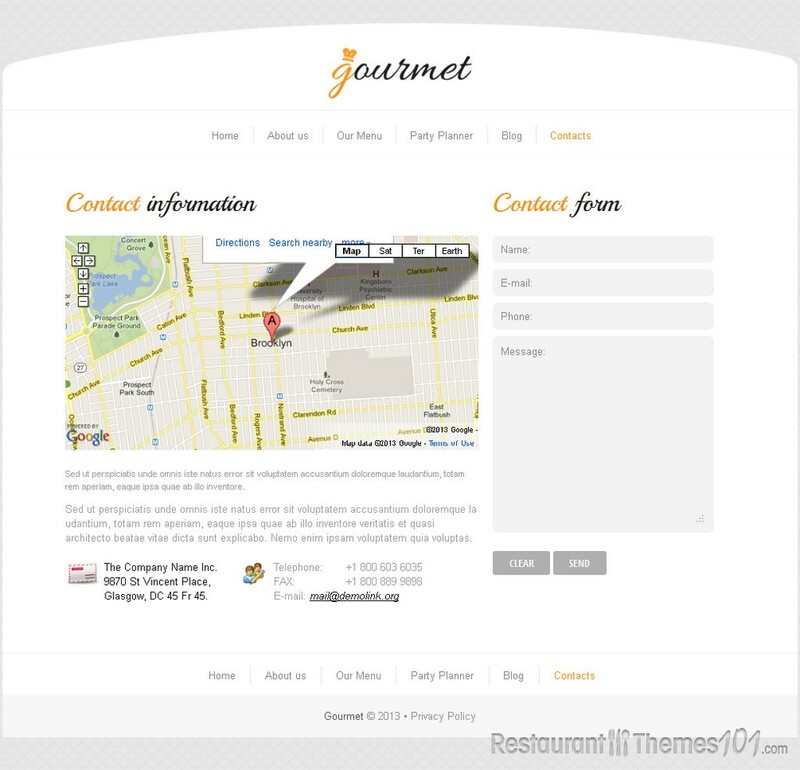 The Gourmet theme is very well documented and it comes with detailed installation instructions. Gourmet features a great admin panel, which is very easy to operate from, even if you aren’t a professional designer. 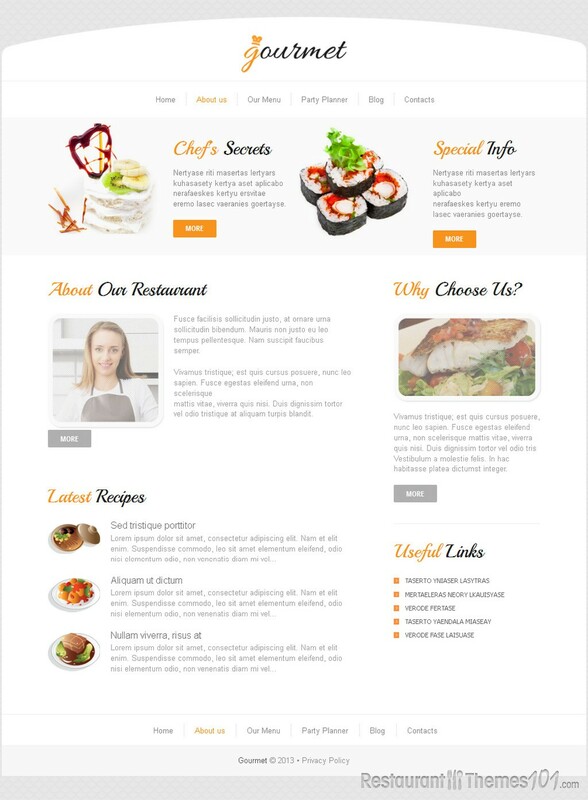 The homepage looks very eye catching with a nice slider which will catch the attention of your visitors right away, the second they open your website. The illustrations of delicious food attract the visitor’s attention immediately and the high resolution of the pictures will enhance the attractiveness of your website even more. The layout has a nice combination of a white background with black and orange elements which make the whole theme look very light, cheerful and positive. The contact area is very nicely done, and it is developed specially for a pretty and functional presentation of any kind of information. 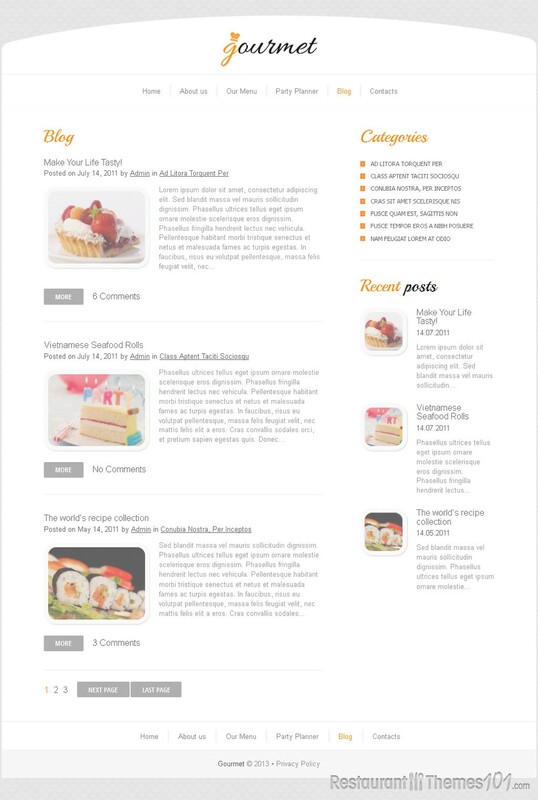 You can create few different menus and present them on your homepage with thumbnails leading to your full content pages. The format of the images fits the layout perfectly, no matter if you want to put a single image for your post display, or for attaching images for your slideshow, or for displaying images as a gallery. In case your post contains a video, this format can be used for this as well, by simply selecting Video format in the appeared metaboxes. You can also add any kind of events or parties in the party planer section. The “about us” section will allow you to post FAQs and showcase testimonials of your satisfied customers to your visitors. 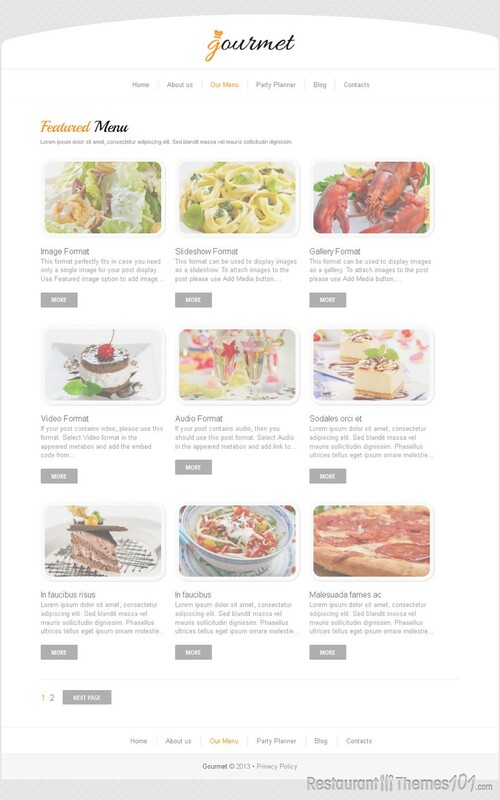 The Gourmet theme can be purchased as a single theme, or as a part of nice bundles, which include installation and domain provided.